When you first find out you’re going to be a parent, it can be a mixture of nervousness, fear, happiness, and excitement all at once! However when bringing new life into the world, no one expects having to deal with the surprise of having a baby weeks before they are due. Not only are you not ready or prepared, but the care and time that is needed in order to take care of a preemie may be overwhelming for many. When this unexpected experience happens, know that there are ways that you and your partner can support each other while you give your little one the care needed. Take time for yourself to let out your emotions. Going through a premature birth and taking care of your new baby causes a storm of emotions that can make it difficult to cope with your situation. There’s a phrase: “You can’t help others if you don’t help yourself.” Don’t be afraid to acknowledge or even start logging your feelings and experience. It will help you make sense of your situation and lead to accepting these whirlwind feelings. Leaning on the support of your friends and family! It’s okay to ask for help, especially if you have little ones of your own that need looking after while you’re in the hospital. On the contrary, you could also use this time with friends and family as breaks—like meeting up for lunch—to give yourself an hour or two to try to relax from the stress. Find a support group that is going through the same experience as you. You could find this kind of support either in-person or online. Talking to families going through the same experience can help feel like you’re not alone. You could also talk to a counselor or psychologist one-on-one if you so desire. 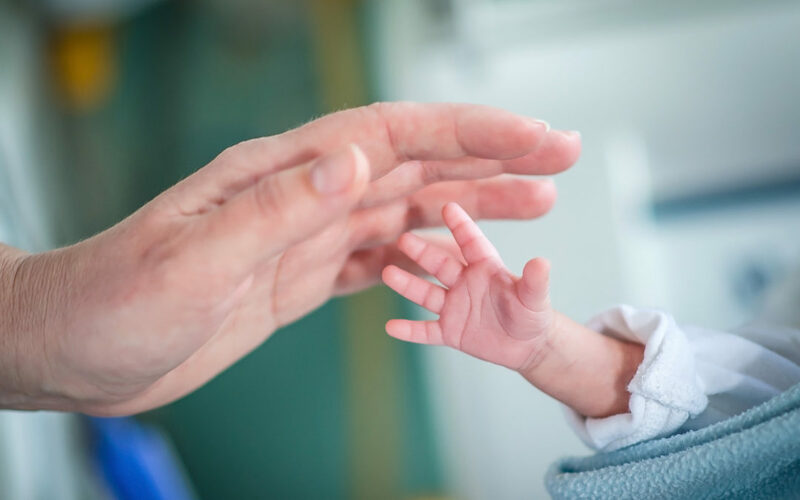 Sometimes hospitals will offer group counseling or private counseling for parents with preemies, just ask a staff member or doctor for more information! Spending as much time as you are allowed with your premature baby is important. With all the machines and sounds, it can be confusing as to how you can help your baby in the Neonatal Intensive Care Unit (NICU). As always, listen to what the doctors and nurses say. It is highly recommended to use skin-to-skin contact, breast feeding, and talking to your baby—they will most certainly recognize the mom’s voice. Also, make sure to limit who sees baby. There should only be three people, including the mom and dad, in the room at one time.. If visitors have children, it is recommended that they are not introduced to the baby while still in the hospital. This helps in regards to keeping a calm environment for the brand new parents as well as protecting the new baby from germs and illnesses. If the parents of the baby have other children, it is acceptable for them to be in there, but make sure to have them practice safe hygiene. In addition to the tips above, if you are not the mother of the baby then it can be hard to know how to be helpful and supportive. Be there for each other and communicate with open-mindedness. Allow yourself to be emotional when you feel emotional and talk to each other about your feelings. Also, show your spouse or partner that you are thinking of them by way of little reminders. This could range from a simple text message to even a surprise homemade dinner! Lastly, the mother may feel at fault for her premature baby. Reassure them that even the experts are not aware of all the reasons why premature birth occurs. A majority of the time, it is not in our control to prevent this from happening. If your spouse or partner shows signs of depression or something worse, approach your concern with a gentle and non-judgemental conversation. Together, talk to your doctor about the best treatments for these symptoms. Communication for you and your partner is vital and key in this supportive process. Want to get involved and help premature babies? We would like to let you know that on April 28 we will be participating in March for Babies 2019, an annual walk that is 3 to 5 miles long which helps raise medical funds for premature babies. Whether you have a preemie, know of someone who does, or just want to support the babies who need money for their healthcare you can help by joining our team or donating to our fundraiser. Thank you!